I'm a KODI user, with Emby for KODI addon installed (LibreELEC / KODI 17). I have an external usb disk, which isn't always plugged, plus it's on a remote computer (another room). If this usb disk is plugged on the remote computer, a script mounts it in LibreELEC as a network cifs share (if unplugged, it's unmounted). - it doesn't appear automatically in library sources if i try to add a new folder (seems normal). - if i try to restart Emby (i did a "systemctl restart service.emby.service"), I notice Emby restarts itself, then i see the mountpoint's path created, but without any subfolders from the share. Folders are accessible in LibreELEC after the mount. How can Emby detect changes in mount points ? Can you give an idea of the paths it is with and without the mount? What is it, what should the path be? I'll try to give maximum details and update. - when computer is up, it's shared as "josspc" network share. In LibreELEC /media/josspc does not exist, so nothing is mounted (expected). In Emby only existing folders are shown in Libraries (expected). 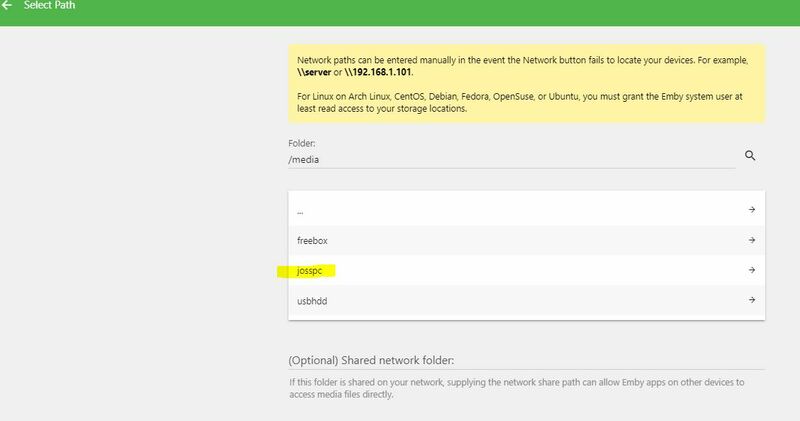 In LibreELEC /media/josspc is then mounted as a network share (accessible with subfolders from remote host as expected). My goal would be Emby detects the network share in /media/josspc when it becomes available/mounted (i'm ok with an Emby restart to find it, if needed). Edited by tealc59, 10 October 2017 - 09:48 AM. Is someone able to help me ? Or have ideas of what can cause my problem ? I'm still blocked and don't know what to do. Have you tried running a library scan to pick up the new changes? Does the emby web app pick up the changes? In KODI, the share is found because it was added as an uPNP source. But in the Emby for KODI addon nothing is found. In Emby Web Dashboard if a try to add a new folder in a library it can't find the share when it's available (only the created folder but with no subfolder from the share). Why can't the Emby dashboard find the share? What happens when you try? sounds like the server doesn't have permission to that location. the emby server can could help us confirm that. what more permissive options could i try ? Can i send you the server logs ? System.IO.DirectoryNotFoundException: Could not find a part of the path '/var/media/josspc/Films'. Directory not found means the server just can't see the path at all so that is likely permissions. After testing a bit, i suppose it linked to CIFS share (creating new folders on any LibreELEC folder, even with 755 permissions,are correctly displayed in Emby Library paths instantly, that's not the case with the CIFS mount point).